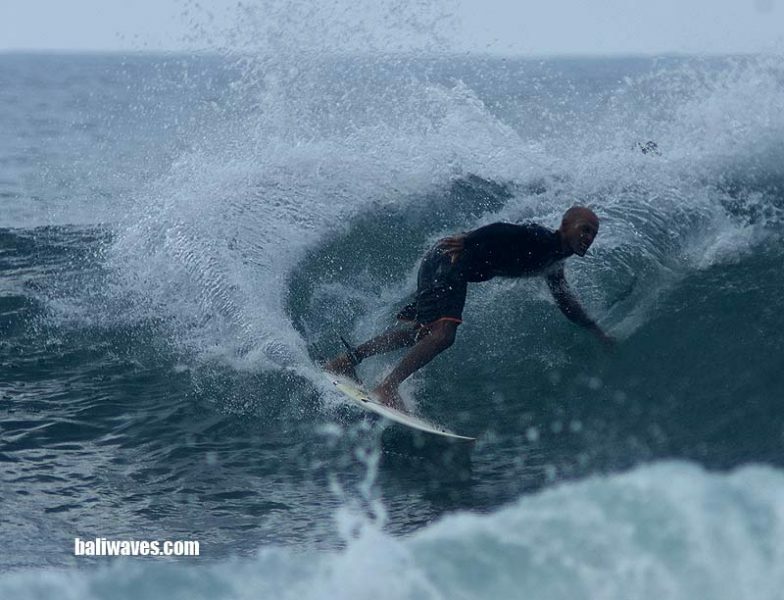 Hi folks and thanks for stopping by the baliwaves (keeping Bali surf reports fresh and original since back in 1999) for our latest news and best possible views on today’s surf here on the island of the Gods. From right here on the No.1 tropical surfing holiday destination and gateway to Indonesia’s surfing paradise, Bali of course. Ok so just a quick one this arvo seeing as though it’s already after 5.PM and I’m just about ready to call it a day. But anyway this morning even though it was mostly overcast and threatening rain (until it eventually did) surfing conditions were pretty good. The wind was light out of the West and wave height was hanging in there as forecasted at 2-4ft. As it shows in today’s photo gallery while Ketut was over on location at Keramas. But by 9.00AM the wind started to tend more to the WSW taking the shine and the prospects for barrels away. Crowd wise there were only 25+ in the water at the time which these days is a light crowd for the small take off zone at Keramas. Weather wise it’s been well below average for Bali’s high standards. Mostly overcast with some rain late morning. Temperature wise it was lucky to hit 28 degree’s Celsius by midday and the wind is W-WSW at 8-14knot. Tomorrows surf forecast is calling in similar sized waves again in the chest to slightly over head class. The wind will be NW early turning West by late morning then WSW after lunch. We also have another early morning Low tide so choose your location accordingly ok.
SURF CAM up date, well I’ve never been a big fan of surf cams, ever. Always been a go down the beach and take a look for myself type of surfer since way back. So as of yesterday we took off the two cams we have had on baliwaves. The Surfline “Uluwatu” cam always seemed to be not working for starters so we don’t want to just collect your imprint / click and waste your time. For me there’s nothing worse that a “dead link” that wastes my time. Our Impossible’s Cam we also pretty much a big pain in the arse and just too much maintenance. With constant everyday crowds at Keramas and Canggu we don’t want to be any part of that cause. So get off your bum / mobile phone and go take a look and see what the surf is doing for yourself. SURF WRITERS dept, if you’ve got something to contribute that other surfers might like to have a read of, maybe a funny yarn or some helpful experience to share. Please send it through and we’ll publish it here on the baliwaves, drop me a line and have a chat if you want. 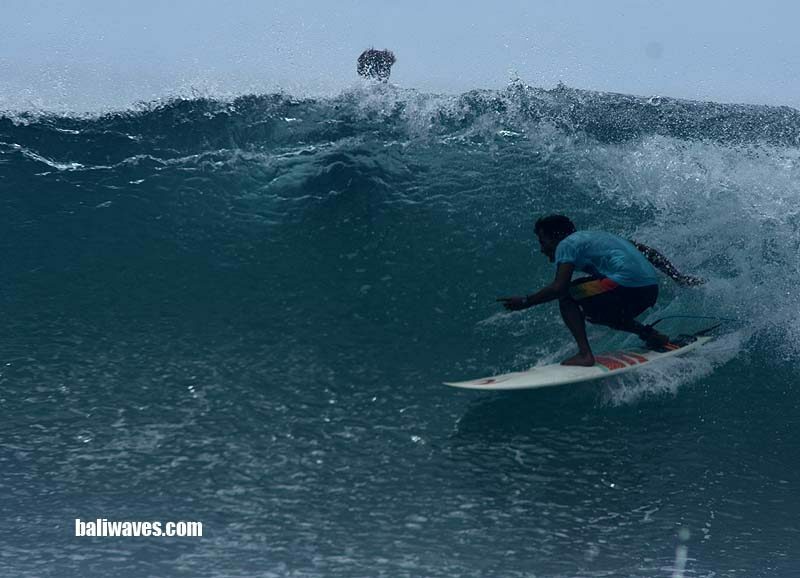 SURFING / ACCOMMODATION PACKAGE DEAL WITH ALL LEVEL OF SURFER WELCOME. WE SPECIALIZE IN FINDING WAVES FOR THE OLDER CREW WHO DON’T LIKE DEALING WITH MASSIVE CROWDS, BUT STILL WANT TO GET SOME GOOD WAVES.